The One Year Book of Devotions for Kids is available with a great look for a new generation of readers. Each day's lesson focuses on a key theme. A great way to help kids connect with God! 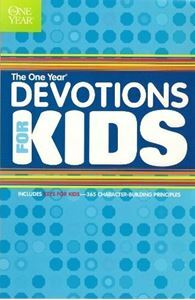 Includes: A contemporary story Application questions Memory Verses Action phrase Spanish language devotionals also available.